Get ready for this all-American dessert! 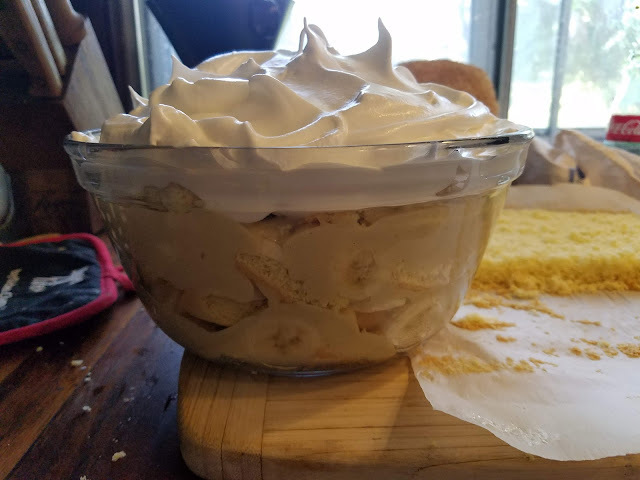 A banana pudding as we Americans know it is mostly - for all intents and purposes - a sort of trifle. Trifles are often a star on The Great British Bake-off with a 400-year history. 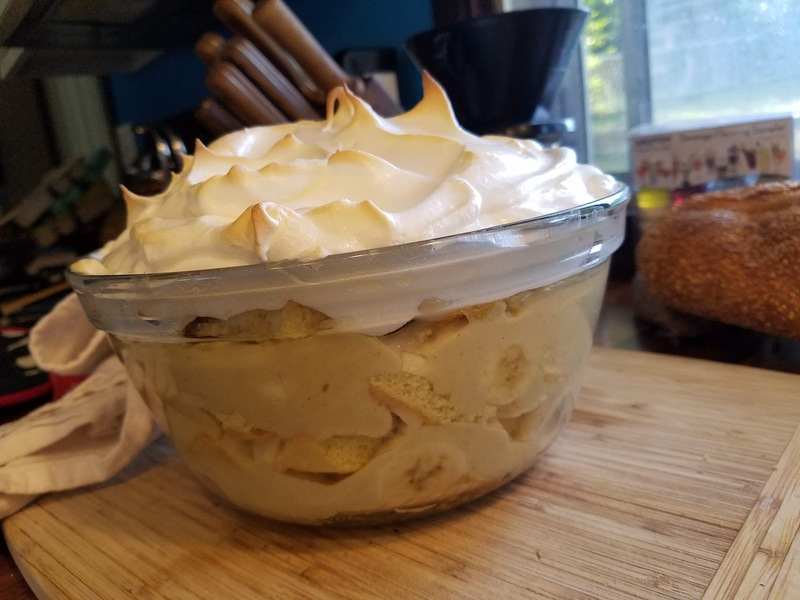 Trifles have to have compatible flavors, as the great Mary Berry says, but to me the flavors of banana pudding are just...banana, vanilla, and sweet cream. My fiance, B, is highly lactose intolerant and eating dairy-free is kind of the only saving grace I sort of give myself for not keeping kosher. So, for my Jewish readers, this is pareve! Woohoo! American regional cuisine and the study thereof is a sort of passion of mine. I think it's so interesting to see how we, all in the same country, can be so different. We've got a beautiful melting pot of cultures that has evolved because of the many different cultures that came from other places. If you ask me, the American South has one of the most-interesting ethnically historical stories to tell. New Orleans alone brought ethnic diversity from all over - all because the nobility of a certain time shipped criminals and enemies of the state off to another land. Hilarious! Preheat your oven to 400 degrees. 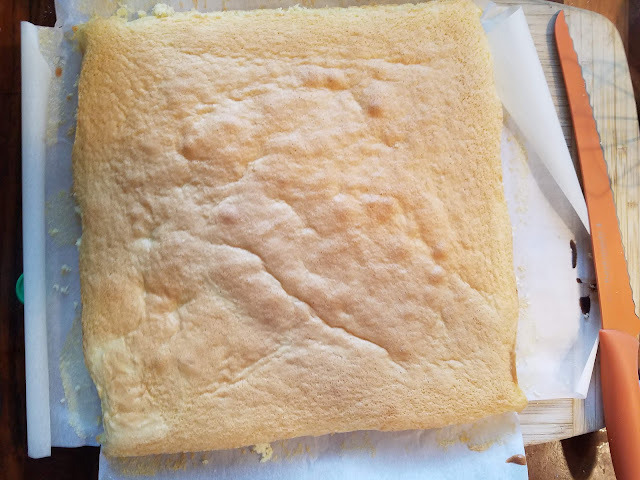 A spongecake is different from your standard cake in the sense that it needs to not be greased in the tin, as the bubbles need somewhere to climb. I used my square pan, so I lined it with ungreased parchment paper. And, yes, this does mean that you can use this recipe to make cupcakes, but I'd recommend adding in half a teaspoon of baking powder if you do so, just for a little insurance. **In this recipe I used about half a teaspoon of key lime essence, which came in an oil form.You can use vanilla extract, orange zest, just about anything! This is such a basic sponge that you can even pulverize some nuts in there and fold it in. The sky is the limit. Whip your eggs and sugar together using the whisk attachment of your standing mixer, and when I say whip it like a cyclone, I mean whip it like a cyclone. This should take about four minutes in your standing mixer, starting on medium and ending on high. The volume should triple, of course, and while that's whipping, go ahead and measure your flour and salt together. Fold in the flour in little shimmy-shakes, ideally through a sifter/strainer. Fold them in gently, please, as we don't want to disturb the bubbles too much. Add in your flavoring and pour into your prepared pan. If you've spread this evenly in a sheet pan, you'll only need 10-12 minutes tops for this. I had a square cake tin, so I did 20 minutes, or just until it was set. I'm not going to be rolling this cake, though, for a roulade so I'm okay with having it be a hair drier than the average bear. 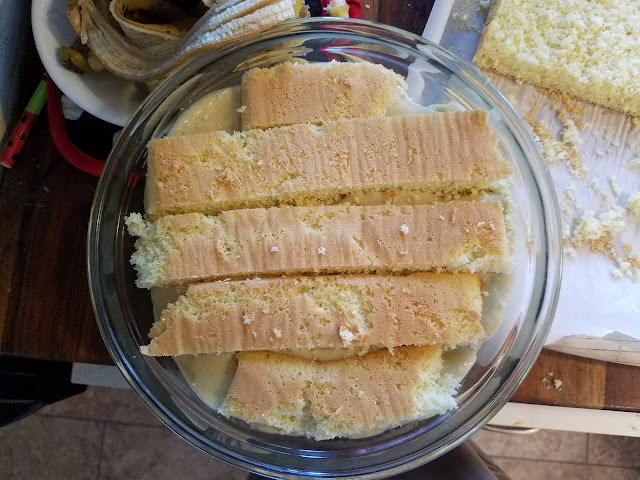 The cake will bake beautifully, but please be sure to allow it to cool before removing it from the tins for at least 15 minutes while you make your custard. Otherwise, the bubbles could risk popping and you could risk your cake deflating. 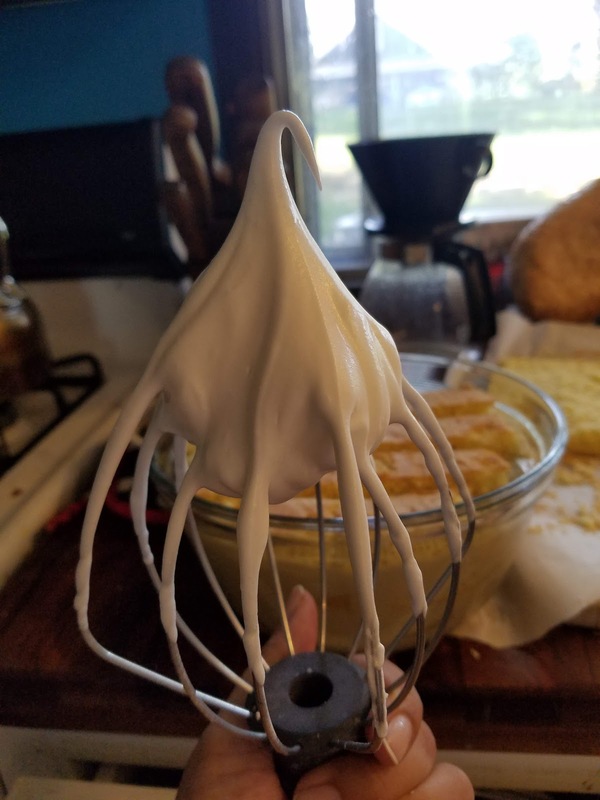 Clean out your standing mixer bowl and whisk thoroughly and dry. Separate your eggs so that the yolks go in the bottom of a saucepot and the whites go in the bowl of the standing mixer. Add the 1/2 cup sugar, 1/3 cup flour, and vanilla paste to the pot as well and whisk until homogeneous. This will take a hair of elbow grease, but I believe in you - you're strong and you can do the thing. Add the milk, a little at a time, whisking in until everything is quite smooth. Introduce some medium heat and whisk constantly, being sure to get the corners. You're going to want to cook this custard without boiling it, so make sure that you keep a thermometer around to watch for 180 F/82 C degrees. You'll know when it's thick, of course, to turn down the heat while you check. Once it's ready, remove from the heat and set aside. They should be glossy and smooth and should not be lumpy or look dry. If you do, however, overwhip your whites, don't panic. Just add one more egg white and stir/whip in. It will salvage the meringue enough to use it. Presto! Keep that oven on at 400 degrees while we assemble this pudding! Glass bowls are preferred for this endeavor because you can both see the layers and most glass is extremely durable. Your standard pyrex bowls that you get at the grocery store is oven-safe, but please be diligent and check the bottom of the bowl to see. You may also use a metal bowl, but let's be honest, you want to see the layers. Take your sponge cake from the tin and peel away the parchment. I sliced mine in half lengthwise because I didn't want large cubes, but you can cut them however you want. I cut mine in about 3/4" strips to fit the bowl. I did have some leftover, but that's okay - you can spread jam between the layers and eat it like a sandwich later this evening. Drop a wee dollop of custard in the absolute bottom of the bowl just to keep the spongecake in place. 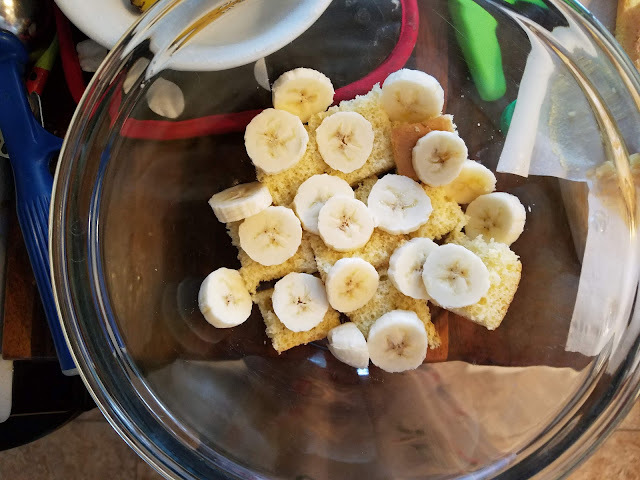 Layer on the sponge, then the bananas, then the warm custard. The reason you want to layer this on while it's still warm is so the bananas will cook. By letting them cook, you get away with using less sugar, and you don't have to soak the cakes in rum if you don't want to. If you want the rum, however, sprinkle it on each spongecake layer while you build up. Live your best life. I mean, don't add booze if you're going to be serving this to kids. Or do. Whatever your laws are. Keep layering up and up and up until you reach the topmost point of the bowl with custard being your top layer. You want moisture, of course, but if you must have that extra kick of rum, please layer with a thin bit of spongecake and give it a good solid drizzle now. Oh yeah. Seal in that goodness. Do it. Spread the meringue thick atop to cover. It is of the utmost importance that you scrape the side of your spatula to secure/seal the sides of the bowl. You're creating a protecting layer of meringue, here, to keep your custard safe. Give it a few swirlies, though, with your spatula for the aesthetic. While you can broil this with a torch, I think you should keep it classic and just bake it for 5 minutes. Glass, while extremely durable, gets fragile and will explode with drastic temperature changes. So please, oh please, do not take your glass bowl from the fridge and then immediately put it into a screaming hot oven. I know that most Pyrex bowls are safe for this, but the last thing I need is a lawsuit. Let the glass come up to room temperature before you bake it. Or just make this right before your party, cook everything else, and then bake. You'll be fine, especially because it's nondairy. The reason I love hemp milk in this recipe is because it's very high in fat. It has a whopping 5 grams of fat per serving, and has a wonderful complex taste as well. I think that the depth of hemp milk is perfectly appropriate for this dessert, and I encourage you to try it out as well. Please experiment with all different types of milks and tell me how it went! Thanks so much for reading! Happy cooking and happy eating!